Green peas is normally processed and stored in frozen form. 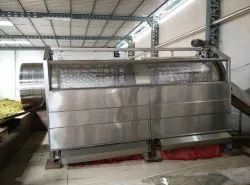 We offer fully automatic and semi-automatic plants for green peas processing. The plant includes machines for depodding pea grains, winnowing, washing, blanching, cooling, dewatering, recovery drum etc. The number and size of machines depends upon the capacity of the plant.